With the dawn of the internet age beginning as far back as the 1980’s, the first websites needed a platform in which to be viewed on. Thus, the birth of the first internet browsers were created. The first internet browser was known as ‘Lynx’, which is still in use today (though very different from its humble beginnings). Lynx was developed at the University of Kansas in 1992. Lynx has since become one of the foundations of internet browsers today. More modern and well known internet browsers began to surface not long after this. Internet Explorer was one of the first browsers that exploded in popularity. It was first released with Microsoft 95 plus package, and during the 90’s. As technology for the internet flourished, so did the variety of browsers that became available. Mac then released the Safari browser. Safari came bundled with the operating systems for it (just the same as Microsoft released IE with Windows). And for a time, Safari remained the sole browser for Mac computers. As Mac popularity grew, so did support from many different browsers, as well. Once known as Phoenix, Firefox became somewhat of a phenomenon following its release in November, 2004, due to an aggressive marketing campaign, and its sheer ease of use compared to Internet Explorer. It also came with a unique ‘tabs’ feature, so that a user did not need to open windows and clog up the task bar, but rather could open multiple internet pages in the one browser window. That, along with its frequent updates by not only Mozilla (the company behind it), but other users, made Firefox a far more impressive platform to use. Internet Explorer continued to perform badly against its rising competition. Not only did it fail to update with the updated coding languages that were being used more frequently on websites (CSS, for example). But many websites were beginning to display incorrectly on Internet Explorer due to this. More and more users began to migrate over to different internet browsers. And as a result, Internet Explorer was all but left in the dust. Today, less than 20% of web users still use Internet Explorer as a result of both poor handling, infrequent updates, and terrible support of modern coding languages. 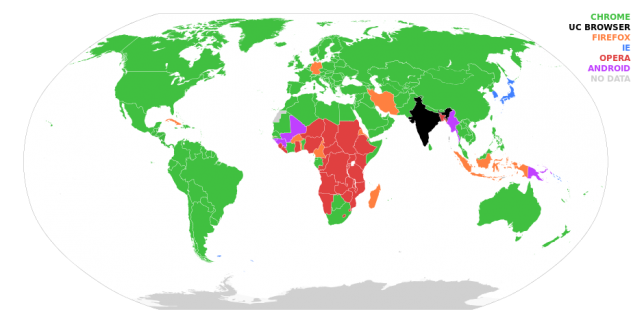 Most popular browser use by country. 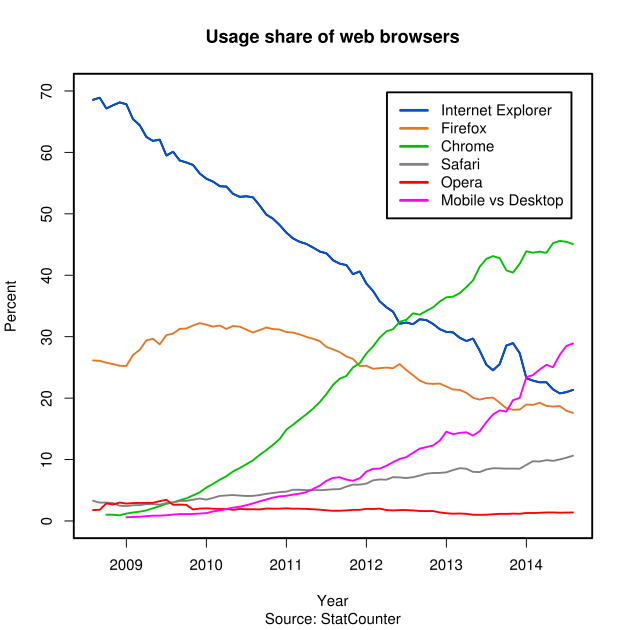 The usage share of browsers over the past 6 years. Another big player entered the market in 2008. This was Google’s own browser, Chrome. Taking on board the tab functionality that Firefox had, and combining it with a slick design, along with already growing Google functionality such as Google Docs, Gmail, and Google Drive integrated into the browser as well, Chrome hit the ground running and within only a few years became the most popular browser on the internet today. Over 50% of users worldwide now use Chrome. Internet Explorer, Firefox and Safari fall into second, third and fourth place respectively. Chrome continues to increase in use daily, with more users switching to it. But why is this the case? Chrome offers frequent updates. It also has flash player automatically integrated into the browser. Google Chrome also updates Flash Player automatically. This became a huge usability issue for browsers that did not offer this functinoality. Along with it supporting the most up to date coding languages (such as CSS3 and HTML5), it also has integration into Google Drive. Developers tend to favour Google Chrome as their browser of choice, as well. This makes Chrome incredibly functional and easy to use, as well as its installation being very easy to run. At present time, Chrome continues to grow in popularity while Internet explorer continues to decrease. The other major browsers (Firefox, Opera and Safari) continue to hold steady with no major shifts either way.